Setup => Company Setup => Use Barcodes on Stocks => tick to enable the "Generate EAN-8 Barcode" button and for reports to display the barcode. Untick it to suppress the display of barcodes in the reports like Stock Check Sheets (rep303.php). The category to which the Item belongs. You can create your own Item Categories which define relevant tax types, ledger accounts and units of measure for the item. You should mark the items/producs as SERVICE when there are no inventory needed when using (selling) the items. The Item Tax Setup is rather counter-intuitive. Retained as such for backward compatibility. Now about sales prices, in Sales Types you can define two kinds of pricelists: with tax included, or tax added. If Sales Type price list has Tax included checkbox ticked, final item price is: $100 = $95.24 + 5% GST. Otherwise tax is added to the price, so final price is: $105 = $100 + 5% GST. Service - inventory not managed for Service items. Don't forget to set the COGS account to your cost account. If set, item description can be modified when entering a sales order or sales invoice. This enables the inclusion of several lines in, say, a Direct Sales Invoice. If set, item will not appear on the list when entering a sales order or sales invoice. If set, item will not appear on the list when entering a purchase order or purchase invoice. This field is active only if dimensions are configured in Company Setup page. All sales and purchase invoices that contain this item are registered against this dimension. Net value of the sales will be booked to this account when registering a sales invoice. Net value of goods delivered will be booked to this account when entering a Delivery document. Cost of Goods Sold Account. Also used for booking net value of services when entering a purchase invoice. Used for Stock Movements and Adjustments. Picture of the Item You may wish to exclude some items (eg. raw materials) from being sold. Excluding items from sales prevents the item from being listed in Sales drop down boxes. Whether Active or not. 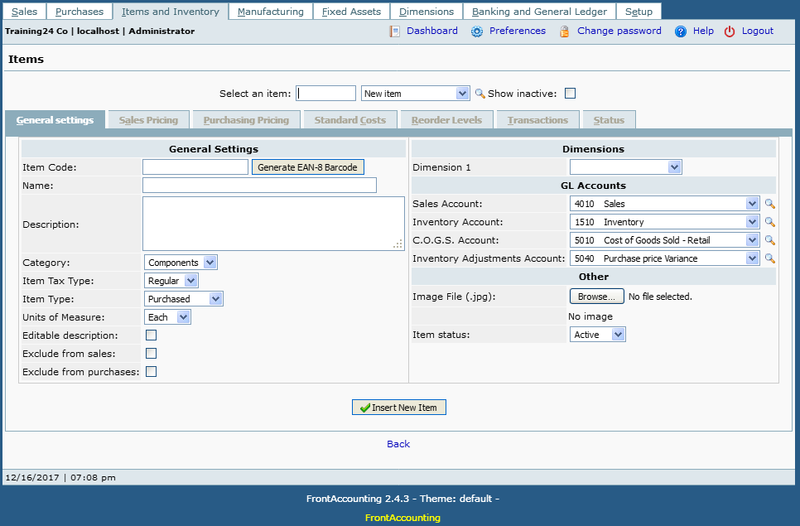 Inactive items are not visible in Sales, Purchasing or Manufacturing screens. You may wish to inactivate for instance when you are developing a product, but do not wish to sell it for the time being. Items are the things you buy and sell in your business. Items are associated with an Item Type which is can be one of three values: Manufactured, Purchased or Service. If you nominate an item type as 'Manufactured' or 'Purchased' you can manage stock control and inventory through the Manufacturing menu. 'Service' items are not inventory controlled. Items are also associated with an Item Category (which you can define). If you have many records you can enable Search Item List in Company setup. You can then start a search by pressing a space in the Item List, or use the edit box in front of the list if such one is available. Now enter fragment of an Item id, category or description and press tab. The list will now be populated with relevant records. If you enter a *, all records will be shown. When creating an item, there is a checkbox that allows one to edit the description of the item. This works fine in Customer Invoicing, but does not work in Suppliers. To do so, if you first click on Add Item, and then click edit the line it works alright - Forum Post. While creating a shipping item, select Category 'Service' and Item type 'Service'. If Item type 'Service' was missed and not entered, use phpMyAdmin (or any other MySQL client) to change this directly in the DB. FA will not allow to change this for security sake, but it should be okay to do it in this case. For items that have an item type of "service," enter an expense account in the "C.O.G.S. Account" field. This is where purchases of the item will be posted to. NOTE: When setting up suppliers, make sure that you set the supplier's default "Purchase Account" field to "Use C.O.G.S./Inventory Account" or purchase transactions of service items will post to the wrong account. Forum Post - If a service item called Discount is created with a negative price, then the unit costs of the other items to which it is 'applied' will become inaccurate.